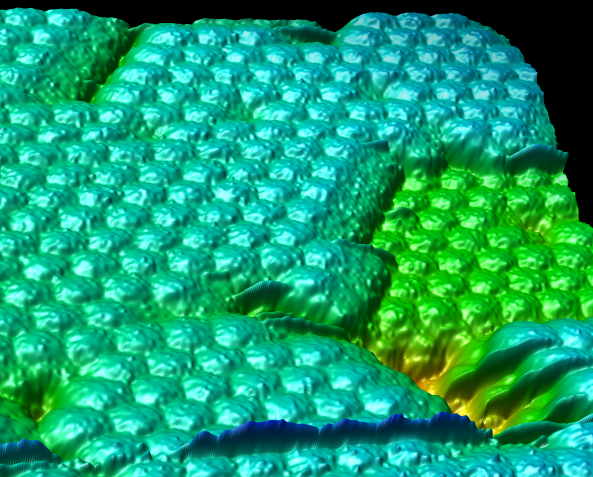 This atomic force microscope (AFM) scan of a crystal of satellite tobacco mosaic virus particles comes from Alex McPherson's lab. Coloring is by height, low to high is red to blue. A few hundred virus particles are shown. Individual particles are about 16 nanometers in diameter. An analysis of average particle surface shape does not resolve the arrangement of capsid proteins on the rather smooth particle surface, but capsid structure is apparent in similar AFM data for other viruses.